An Earth-imaging satellite that will snap the sharpest commercially available pictures of the planet's surface is awaiting blastoff Thursday atop a Boeing Delta 2 rocket. 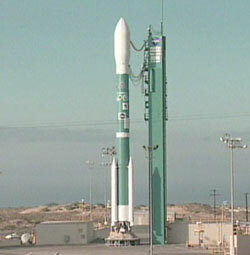 Liftoff from Space Launch Complex-2 West at Vandenberg Air Force Base in California is scheduled for 1851 GMT (2:51 p.m. EDT; 11:51 a.m. PDT). The daily launch window extends 15 minutes to 1906 GMT (3:06 p.m. EDT; 12:06 p.m. PDT). The Delta 2 will fly in its stripped down 7320 configuration, meaning it will have two stages and just three strap-on solid rocket boosters. Making its 99th flight, the Delta 2 rocket will place the QuickBird satellite into a sun-synchronous orbit that covers virtually the entire globe. This will be the third satellite launched by DigitalGlobe, formerly known as EarthWatch, of Longmont, Colorado. But the earlier craft -- EarlyBird and QuickBird 1 -- were quickly lost. EarlyBird malfunctioned four days after arriving in space in late 1997 due to a power system breakdown; QuickBird 1 was destroyed in a launch failure last November. Both were flown on Russian rockets. After the stinging setback from the QuickBird 1 mishap, company officials opted to use the highly reliable Delta 2 rocket to improve the odds of getting their satellite into orbit successfully. "As a company we looked at it and said 'here is the most reliable rocket in the U.S. inventory, in the kind of class we can fly in and it is just an outstanding rocket,'" Herb Satterlee, president and CEO of DigitalGlobe, said in an interview Tuesday. "The reason we did not look at the Delta previously was just very simply it's bigger than we need. And in the launch business bigger means (it) costs quite a bit more. And it is costing more." But despite the Delta 2 costing "a couple times more" than the Russian vehicles used previously by DigitalGlobe, the confidence in achieving launch success drove the company to the workhorse American rocket. "We believe the cost is worth it," said Satterlee. Before settling on Delta, Satterlee said the Lockheed Martin Athena was considered. However, that rocket was passed over because of the failures it had suffered in the past. "The Athena's track record had not been as good and we did not want to take a chance on a rocket that did not have well into the 90 percent success rate." The Russian Rockot was also looked examined. Although it offered a cheaper ride to space, the lack of insight into Russian launch operations was a turn off. Built by Ball Aerospace, the 2,267-pound QuickBird spacecraft, originally dubbed QuickBird 2, will capture black and white pictures that show objects as small as two feet across (61 centimeters). The satellite was designed to provide three-foot (one-meter) resolution from an orbit 373 miles (600 km) above the planet. But DigitalGlobe decided earlier this year to lower the target altitude to 280 miles (450 km) to improve the resolution. "It makes a huge difference to customers," Satterlee said. "It has had a much bigger impact than I ever expected. We've had every single customer without expectation come to us and say 'we are so excited about this.'" The improved resolution will surpass that offered by rival Space Imaging's Ikonos satellite. Both Ikonos and QuickBird are seeking customers from the same fields such as map making, agricultural development, urban planning and environmental monitoring. "To the government customers around the world the one-foot difference is roughly 25 percent improvement in the actual spacial resolution, but it means a doubling in the pixel count, which means there is a lot more information in each image," Satterlee said. "For the mapping customers it means the geo-location accuracy can be achieved in a much higher quality than what we could have done with the first system -- QuickBird 1. So we can make much better quality maps faster because we don't need as many ground control points," Satterlee continued. QuickBird's color imagery was improved from 13.2-foot to 8.05-foot resolution (4-meters to 2.44-meters) with the orbit change. Heightened security at the Vandenberg Air Force Base launch site, located 140 miles northwest of Los Angeles on California's Central Coast, forced DigitalGlobe to scrap much of the fanfare surrounding its crucial liftoff. "We would have loved to have been out at Vandenberg. We had a lot of customers coming and we were obviously very excited. But with the closing of the base and our inability to have anybody but our launch team there, we have tried to have a party here at Longmont, but it's just not going to be the same," Satterlee said. Boeing spokesman Robert Villanueva says pre-launch preparations are going well and the rocket's second stage was fueled on Monday as planned. The Air Force weather forecast calls for a 70 percent chance of favorable conditions Thursday. The main concern is thick clouds.